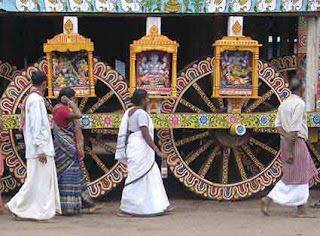 The three chariots (Raths) used for the annual Puri Jagannath Ratha Yatra are newly constructed each year. A particular family of carpenters owns the hereditary right to construct the chariots. The construction of the chariots begins on the Akashya Tritiya day, which is around three months before the actual Ratha Yatra day. Each chariot used in the Rath Yatra has specific size and dimensions. The chariots are a classic example on indigenous engineering marvel. Sal wood is used for the construction of the chariots. The wood is brought from the forests of Daspalla and Ranapur. These are chiseled out by around 125 carpenters. They work for 58 days at the Mahakhala – the front portion of the Palace located near the Jagannath Temple. Iron nails, brackets, clamps and other miscellaneous items needed for the chariots are prepared by the native blacksmiths. The structure above the wheels contains eighteen pillars and roofs at various stages. one charioteer all of which are made of wood. Apart from this each chariot has a crest banner. Around 1090 meters of new cloth is used to cover each chariot. Each chariot is fastened with four long ropes manufactured from coconut fibers. The ropes are provided by Kerala Coir Corporation. The throne on which Jagannath sits is 35 square feet. The Rath (chariot) of Lord Jagannath is guarded by Garuda – the mythical bird and vehicle of Lord Vishu. The wooden horses driving the chariot are named as Shankha, Balahaka, Suweta, Haridashwa. The rope used to pull is called Sankhachuda. There are nine presiding deities in the chariot – Varaha, Gobardhan, Gopi Krishna, Narasimha, Rama, Narayan, Trivikrama, Hanuman and Rudra. The Chariot of Balabhadra is known as Taladhwaja. The chariot of Balabhadra is guarded by Vasudev. The horses are called Tribra, Ghora, Dirghasharma and Swornanava. The rope used is named Basuki. Ganesha, Kartikeya, Sarvamangala, Pralambari, Hatayudha, Mrutyunjaya, Natamvara, Mukteswar, and Shesha deva are the nine presiding deities. The Chariot of Subhadra is known as Darpadalana. It is also referred as Padmadhwaja. The chariot of Subhadra is guarded by Jayadurga. The charioteer is called Arjuna and the flag is Nadambika. The horses are Rochika, Mochika, Jita and Aparajita. The rope is called Swarnachuda. The nine subsidiary deities in the chariot are all female deities – Chandi, Chamunda, Ugratara, Vanadurga, Shulidurga, Varahi, Shyamakali, Mangala and Vimala.